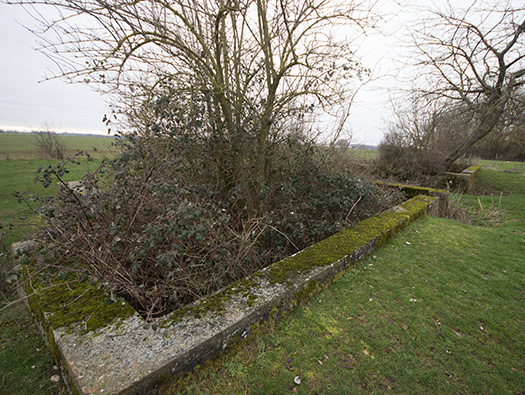 Führerhauptquartier ´Wolfsschlucht 2´ Flakstellung ´C´, Vauxaillon, Soissons, France. 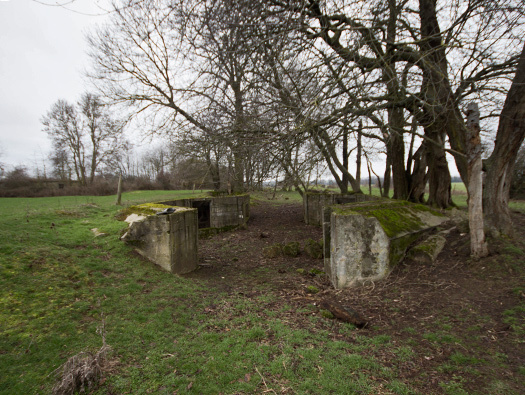 Just outside the village of Vauxaillon on the way to the batterie are these two 108A (R607) ammunition magazines. R607 ammunition bunker plan, very like these. 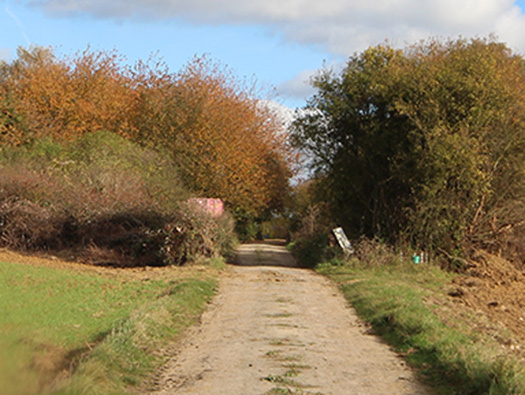 Flakstellung ´C´ Vauxaillon road leading to the site. 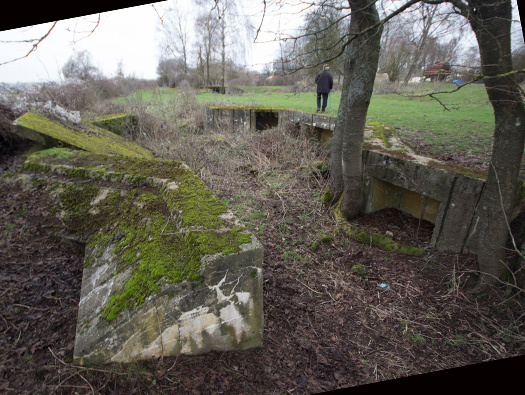 One hundred and fifty five meters above sea level and views of 360° this Flak site covered the northern quarter of the Führerhauptquartier. 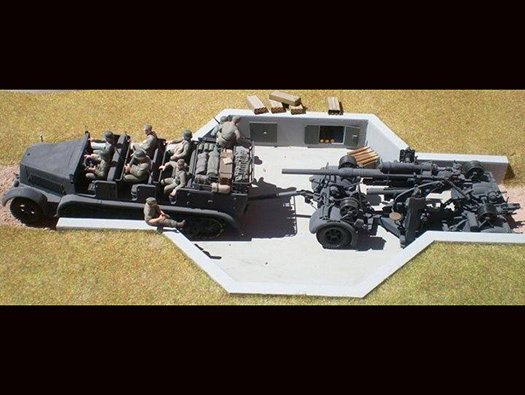 Six 10.5cm Flak 38 set out in a circle with four 2cm Flak 30. 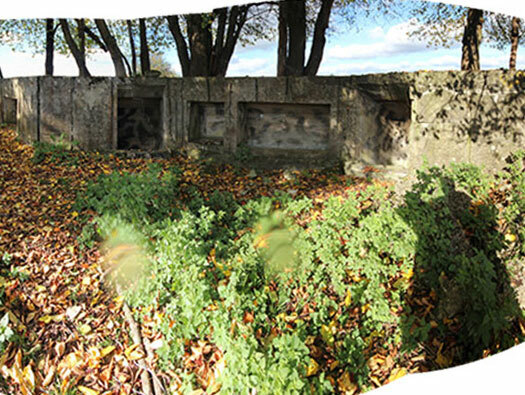 L427 machinery bunker for heavy flak. Plan of a six gunned Flak batterie. 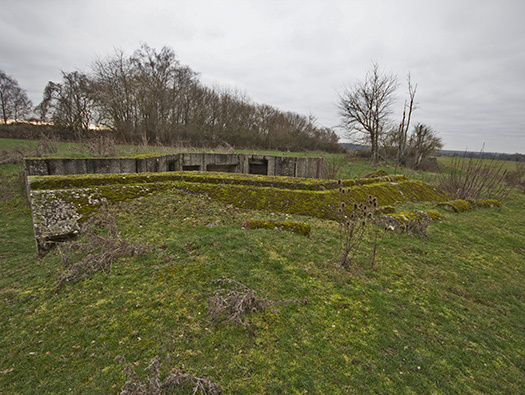 1 x L413 munitions bunker. 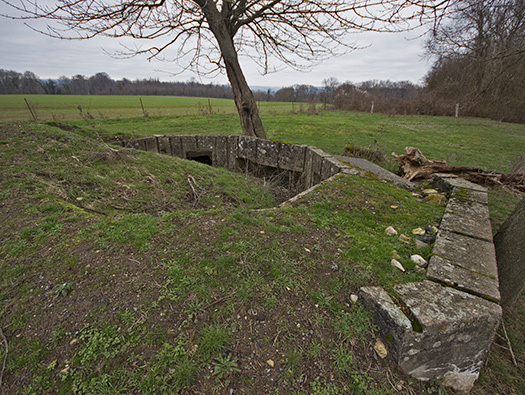 1 x L425 Flak bunker. 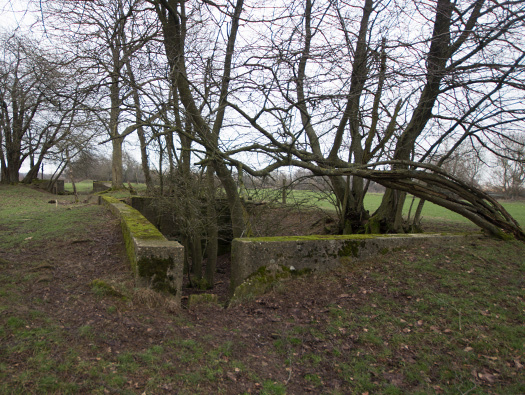 1 x L407 ammunition store. 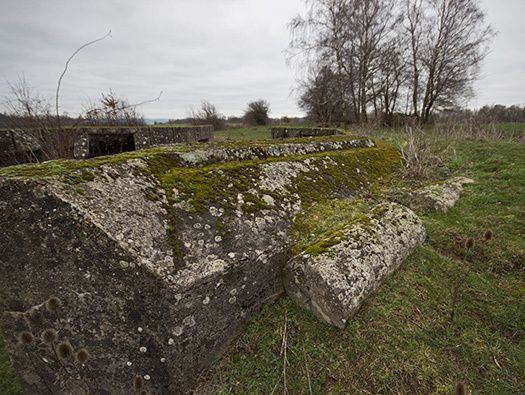 6 x 103A heavy Flak emplacements. 3 x L1 emplacements for 2cm Flak. 1 x L427 machinery bunker for heavy flak. 6 x 10.5cm Flak 38. 7 x 180A water tanks. 101a Tobruk for two men, bunks and heating. L425 for possibly a fourth 2cm Flak 30. L413 ammunition for a 3.7cm Flak but here may have used it for 2cm ammunition (now removed). 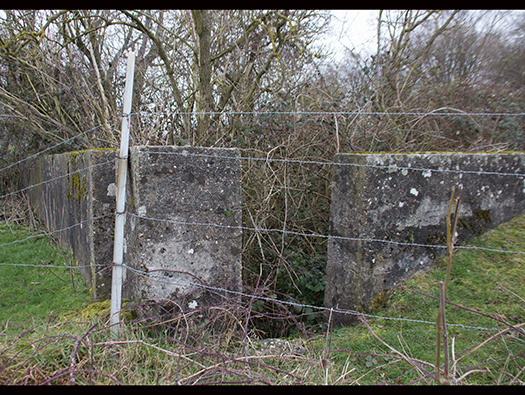 As you walk up to Flak 'C', on the right is Vx329 a 124A Latrine. To the left of Vx990 is Vx329 a 101a Tobruk for two men, bunks and heating and is very hard to see. Other types of latrines in the open air. 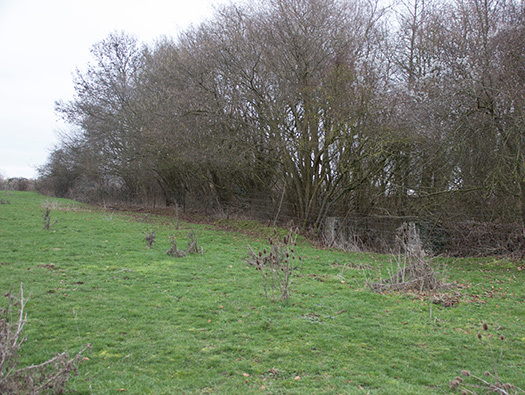 The main entrance, to the right in the hedge is Vx332 a water container with two openings. (that may mean two entrances). 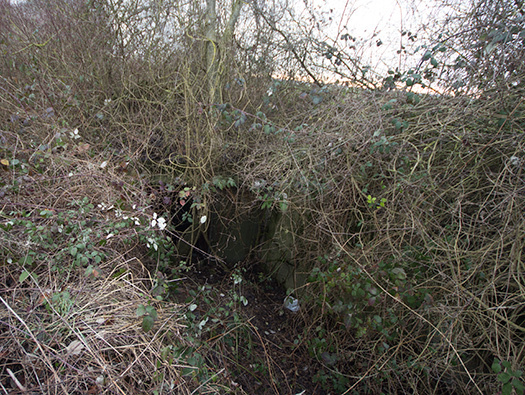 Water container bunker with two entrances..Full of brambles now but hopefully less prickles then. What looks like a vent on its roof..
Coming into the flak 'C'. I have to say why are farmers the worst at spoiling the countryside. Most of this is un recyclable rubbish. Two protected barracks in the B II area. Stand for B II. Underneath of Vx404 is Vx 405 an R621 the command centre of site B II. R621 group shelter and the B II. Another view and looks like a window. So may have been a guard room?? 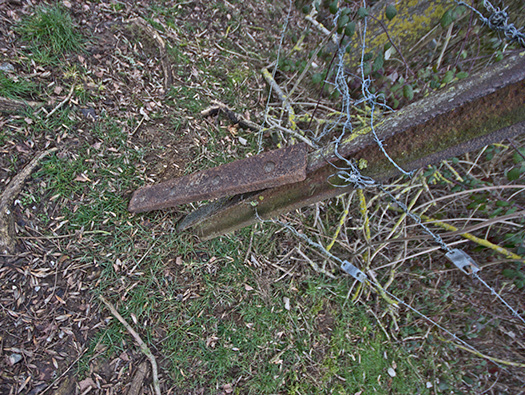 A light railway track now used as a fence post and a fish plate leaning against it. Vx904 four 18A water tanks. 103A gun stand for a 10.5cm Flak 38. 103A gun emplacements for 10.5cm Flak 38 guns. The second 103A gun emplacements for 10.5cm Flak 38 guns. Grooves around the emplacement to take the shell splinter cylinders. Vx16f & Vx406 sheltered barracks. 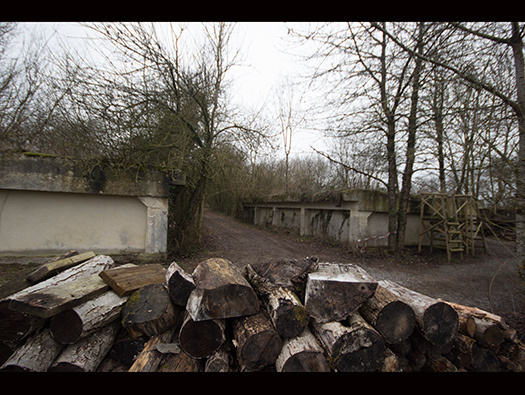 Small & large sheltered barracks. A large sheltered barracks. 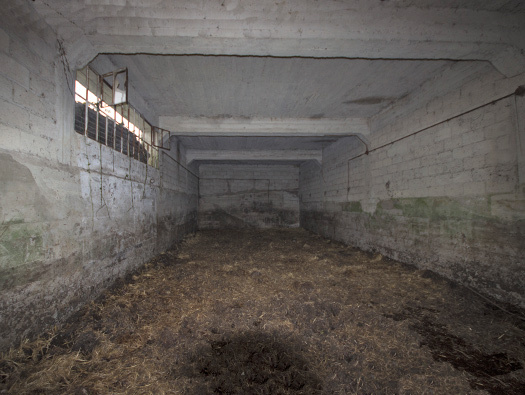 This barracks was only a sunken protected hut larger than the others we have seen and this one was made into a large garage when NATO in the 1950's used it as a radio site. The other side of the barracks. This side has widows allowing enough light in. 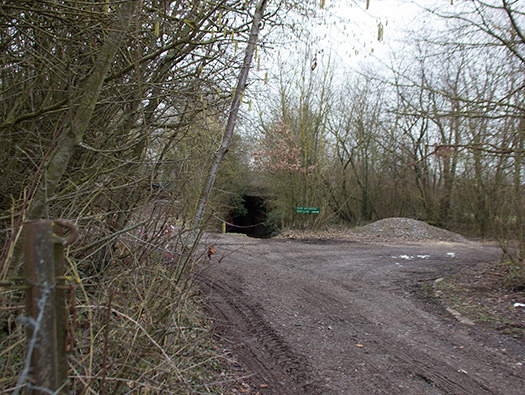 The large entrance was made by NATO to allow vehicular access.. The doors to the garage. This looks like a boundary stone?? L1 Geschützstand für 2cm Flak 30 in the distance. L1 Geschützstand für 2cm Flak 30. 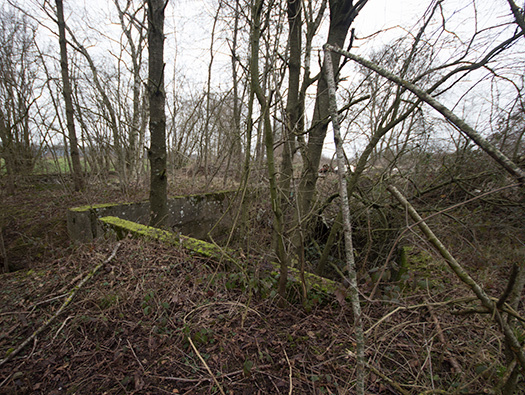 In the woodland were Vx431 seven protected barracks, meaning that they were semi sunk into the ground with a low concrete wall around it. 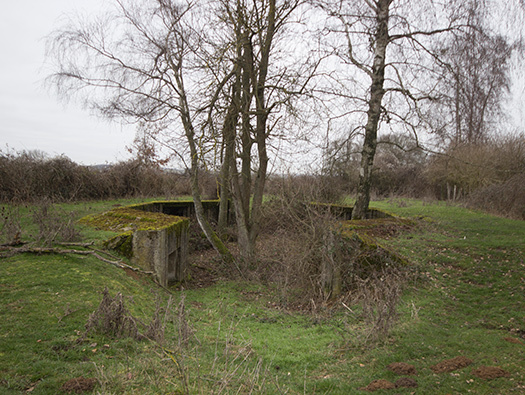 There was also Vx432 - an L413 ammunition bunker for the light flak ammunition and a garage. This is area B I. 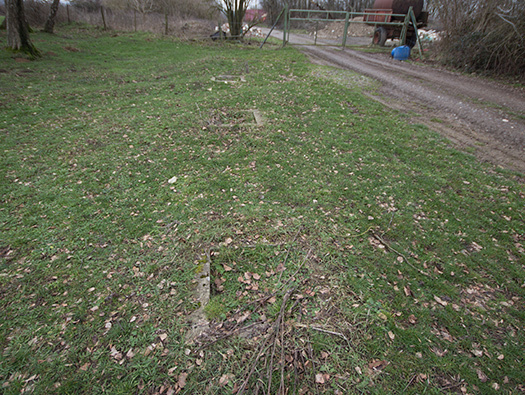 Base for a protected hut. 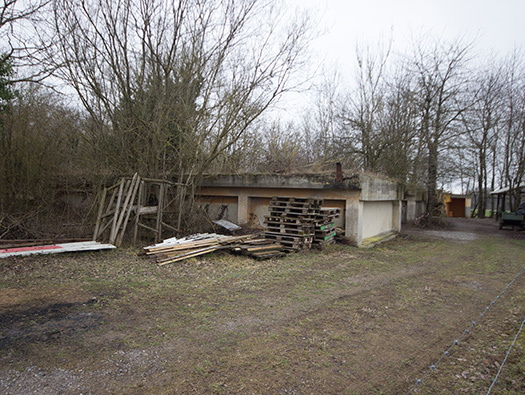 Bunker garage, in the picture a 2cm A/T gun but any vehicle that fitted could use it. 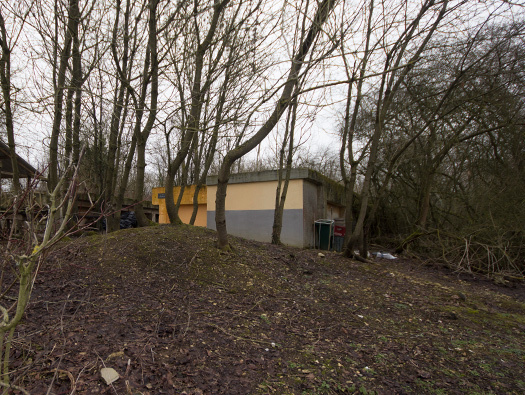 There may be a bunker for radio, one for radar, one for command and a generator. Vx429/426/407/430 and some water reservoirs. In the woodland of B I area. One of the protected barracks turned into a garage for NATO. 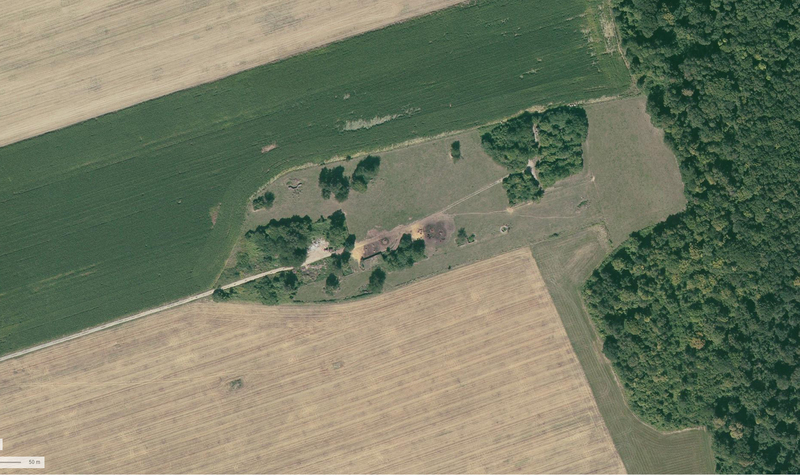 This whole area of B I was used by NATO as a radio signals area.. 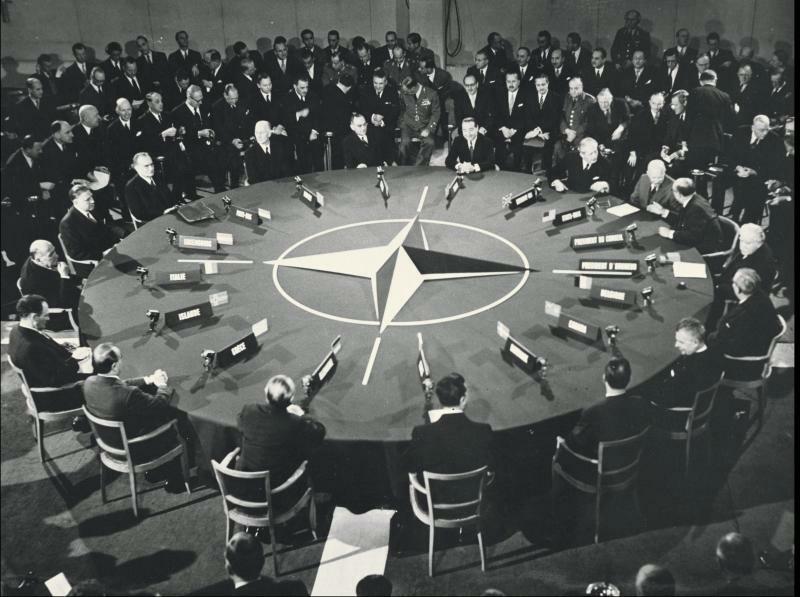 So we are not seing a typical WW2 site but a much modernised complex for NATO. 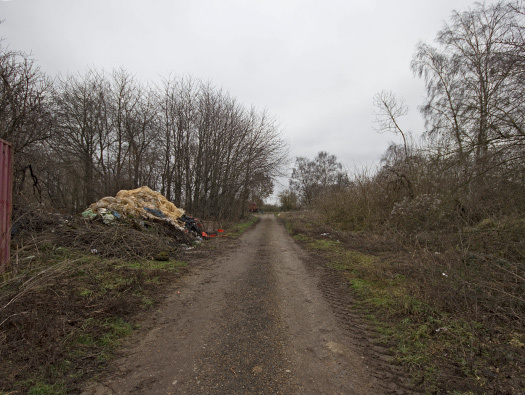 They then left and the site was left derralict. .
Command building may be the Vx407 an L425 a B II command post for AA. and above a command post. Plan of Vx407 underneath Vx429 above. 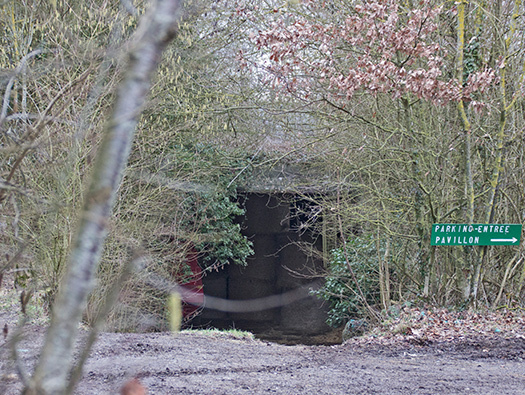 L425 AA command bunker . 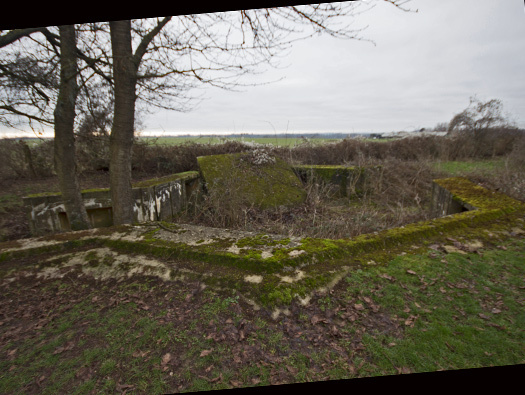 L1 emplacement for a 2cm Flak 30. 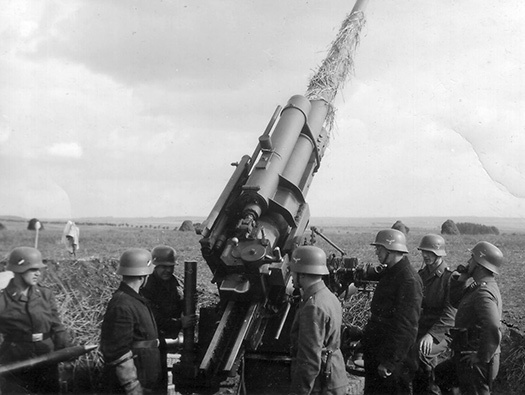 103A Geschützstand für 10.7cm Flak 38. I found this picture which shows the way the Flak gun may have been mounted, except on these possitions at Vauxaillon the floors were earthen for some reason.. Note the camouflage painted on the back wall of the ready ammunition niches. Closer look at the camouflaged niches. 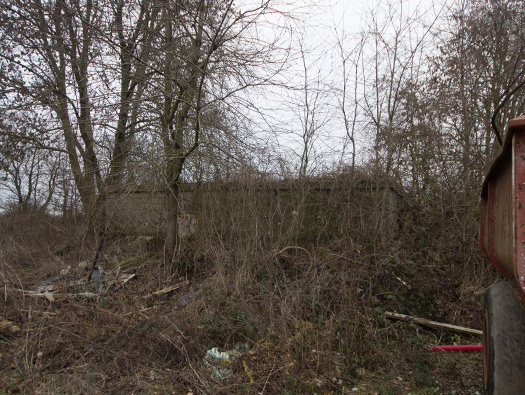 103A emplacement for the fifth gun. This is actually an 8.8cm Flak but gives an idea of crew araingements and ammunition handling. the third from the left is placing the nose cone of the shell to adjust the range. 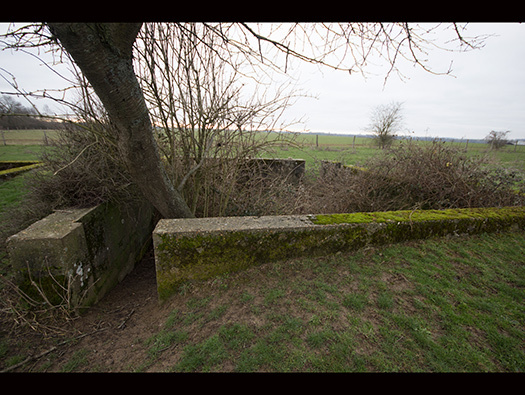 Around 103a emplacements were large concret rollers, they could be hauled up onto a lip around the tops and that gave the emplacement a bit more protection, if they needed to lower their tragectory, the rollers could be rolled down as in this picture. Splinter roller in the up position. Plan of a splinter roller. 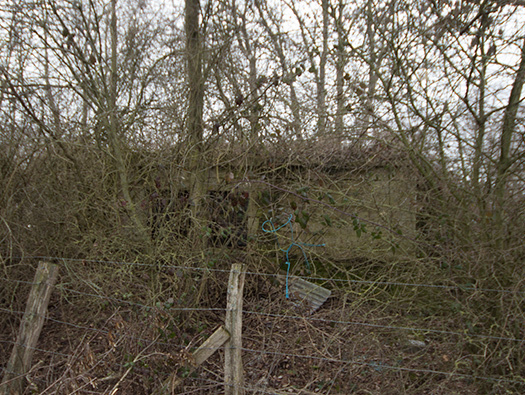 The splinter wall with a hut inside as it may have looked. The road even had kerb stones along its side. The road out and the wonderfully large sky. Ideal for a Flak site. looking west.